With the majority of the wedding style planning being complete and under control there are some of the legalities of the wedding that need to be finalised. Part of this process includes meeting with your minister ormarriage celebrant to not only determine the running sheet for your big day but to complete the official paperwork and legal obligations. Your minister/celebrant will guide you through all the official parts of your wedding so this is simply a heads up on what to expect. It will also vary depending on your officiant and from tradition, religion and other beliefs therefore the information will be very general. For your wedding to be recognised as legal in Australia you must lodge the completed “notice of intended marriage” form with your minister/celebrant at least one callender month prior to your wedding day. This form can be lodged up to 18 months in advance for those that like to be organised. 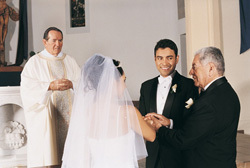 Both the bride and groom must be of 18 years of age to be legally wed in Australia (you are required to sign a declaration stating so prior to the wedding) and show your birth certificates if born in Australia; if born overseas, your birth certificate and passport from your country of birth to the minister/celebrant. Details from these certificates are taken and recorded on the paperwork required to lodge and register the marriage. Those that have been previously married are to show the Divorce Decree Absolute or a death certificate of the previous spouse concerned. You will be asked to sign and declare that you are not married to anyone else and there is no legal reason why they should not be married in the official paperwork completed prior to the wedding. The wedding ceremony must have two witnesses that are 18 years of age. For international visitors these can be arranged for you if you have no family or friends attending the wedding ceremony. Pre-marital counselling is generally advisable and will often be mandatory as part of a priest or ministers requirements to marry you. The counselling will often be completed by the couples religious adviser, that is the minister or celebrant marrying the couple. The pre-marital counselling is either one or two meetings or even a series of sessions that will take place prior to the wedding day and will vary from couple to couple. This assessment is not only to prepare the couples and further educate them about marriage and its importance but to determine any underlying issues that should most certainly be resolved before making such a commitment as marriage. A minister/celebrant has a duty of care to ensure the couple they are marrying is fully informed and prepared for the road ahead. It would be irresponsible of a professional to marry a couple they did not see fit to make this life long commitment. Non-religious, professional counsellors are also available for pre-marital counselling services and can provide a much needed insight and understanding of each other before the wedding day. The content of the sessions and length of services will depend on the couple and counsellor. Earlier in the Lissylane Wedding Check-list the ceremony was discussed in brief however there are some important decisions to make about the running of the wedding service. Traditionally speaking at the beginning of the wedding ceremony the bride is “given away.” In modern day services though many brides tend to change the wording of this; in this day and age females are considered independent and belonging to no one but themselves. Some brides will however stay with tradition although it is becoming more and more popular for the opening words from the minister/celebrant to be altered. Tradition plays an important role in a wedding service and as mentioned these will vary from religion to religion and of course for a civil ceremony. The inclusion of special readings and hymns are generally a traditional aspect of the wedding service with some popular bible readings being used traditionally such as “1 Corinthians 13” often referred to as the “love passage”. For a civil ceremony or some other religions the readings are something that can personalised and make the day a little about who you are as a couple. Likewise the hymns can reflect the personalities of the bride and groom. Modern wedding services and brief ceremonies can however opt to completely remove readings and hymns from the proceedings of the day (generally more so for a civil ceremony). Vows would be one of the most personal parts of the day and there is no right and wrong, everyone is different. 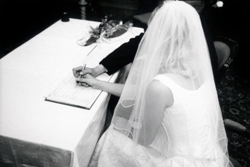 Some people prefer to use the standard, traditional vows or even alter these slightly to suit, others will write completely new and personal vows for each other. Whatever you decide will be a highly personal choice and should be discussed not only with the minister/celebrant but of course your fiancée. 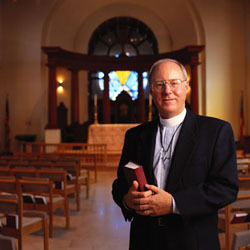 Some priests and ministers are quite traditional when it comes to the wedding vows and may ask that you stick with tradition, this will vary depending on the religion and church in which you are to be married. Likewise not everyone is comfortable writing their own vows so this should be discussed in full, compromises may need to be made. 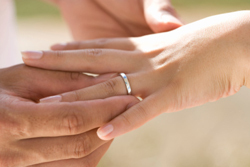 The exchange of wedding rings is a symbol of love and commitment for one another and is yet again another tradition. This tradition unlike the others is often kept as part of the service! Men are actually the exception to this as some prefer to not wear rings at all. Alternatives can generally be used in place of a groom’s wedding band such as a beautiful watch or instead the wedding ring later worn on a neck chain instead of the finger. Something that gets asked quite frequently about the ring exchange is actually a question from the bride: “What happens with the engagement ring during the ring exchange?” Prior to the ceremony it is customary for the bride to place her engagement ring on the third finger of her right hand, leaving her left hand ring finger ready for the wedding band to be placed by the groom during the ring exchange. This allows the wedding rings to be placed on the correct finger and in the correct order. The engagement ring can then be moved over to be positioned with the wedding ring. The order of rings (from the bottom to tip of finger) should be wedding band, engagement ring then later followed by an eternity ring. An eternity ring is also a symbol of ever lasting love (like the wedding band) and is generally given to celebrate an anniversary (such as your first) or other significant event for example the birth of a child. Some variations of tradition wedding ceremonies can include such events as a hand-fasting or unity candle ceremony. Hand-fasting ceremonies are generally practised by Neopagans and are only legal in their own right in some countries. A hand-fasting is generally accompanied by a civil ceremony for the marriage to be made official. Variations of the hand-fasting ceremony are performed as there is no universal service or ritual performed as there are many different traditions of Neopaganism, the ritual is up to the couple being hand-fasted. As part of a hand-fasting ceremony, ring exchange is still present and reflects their commitment to each other. 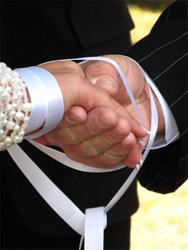 As part of the ceremony the couples hands are generally joined with ribbons or ceremonial cloth. The lighting of a unity candle is a fairly new addition to a wedding service, it involves two taper candles being lit at the beginning of the ceremony often by the mothers of the bride and groom. The ceremony symbolises the joining and uniting of the two families and their love for the bride and groom. Once again variations of the ceremony exist and represent different meanings. 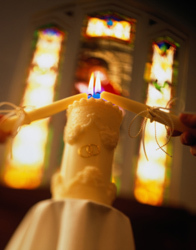 It is customary for the newly married couple to keep the unity candle and re-light it on each anniversary to follow. 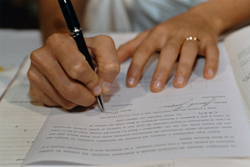 In most cases the signing the register part of the wedding ceremony is actually a mock, all the official paperwork is nowadays complete prior to the wedding day. Gone of the day where the guests were asked if anyone objects to the wedding, the legality and right to be married is a part of the official forms and declaration signed before the ceremony. Even the marriage certificate that you receive as part of your wedding day can not actually be used in any official or legal circumstances it is simply a presentation certificate. Once the marriage is registered by your minister or celebrant you can then request (for a fee) the certified marriage certificate from the office of Births, Deaths and Marriages. The forms required for this in Australia vary from state to state and can be easily found on your local governments website or by visiting your local office of Births, Deaths and Marriages branch. Once the “signing of the register” is complete the minister/celebrant announces and presents the couple as husband and wife. Following this is the customary hugs, kisses and thank yous of the bride and grooms parents from the newly weds and the recessional of the couple and bridal party.